Feynman Lectures on Gravitation, edited by Brian Hatfield (2002), 21. It [the Euglena] is a perfect laboratory in itself, and it will act and react upon the water and the matters contained therein; converting them into new compounds resembling its own substance, and at the same time giving up portions of its own substance which have become effete. From Address (22 Jul 1854) delivered at St. Martin’s Hall, published as a pamphlet (1854), 8, and collected in 'Educational Value of Natural History Sciences', Lay Sermons, Addresses, and Reviews (1870), 75. Now this is the peculiarity of scientific method, that when once it has become a habit of mind, that mind converts all facts whatsoever into science. The succession of individuals, connected by reproduction and belonging to a species, makes it possible for the specific form itself to last for ages. 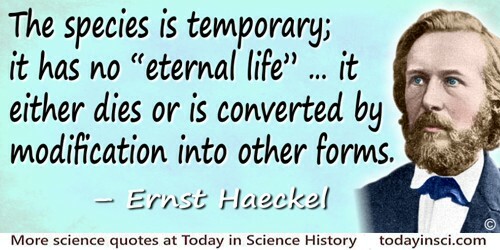 In the end, however, the species is temporary; it has no “eternal life.” After existing for a certain period, it either dies or is converted by modification into other forms. As translated by Joseph McCabe in Haeckel's The Wonders of Life: a Popular Study of Biological Philosophy (1904), 248. The world looks so different after learning science. For example, trees are made of air, primarily. When they are burned, they go back to air, and in the flaming heat is released the flaming heat of the sun which was bound in to convert the air into tree, and in the ash is the small remnant of the part which did not come from air, that came from the solid earth, instead. These are beautiful things, and the content of science is wonderfully full of them. They are very inspiring, and they can be used to inspire others. From address (1966) at the 14th Annual Convention of the National Science Teachers Association, New York City, printed in 'What is science? ', The Physics Teacher (1969), 7, No. 6, 320. Thou canst not make water flow uphill but by expenditure of greater force than draws it down. The spirit of fire can do this,—converting it to steam. Spiritualise water, and it ascends in spite of itself. In Sir William Withey Gull and Theodore Dyke Acland (ed. ), A Collection of the Published Writings of William Withey Gull (1896), lxv.